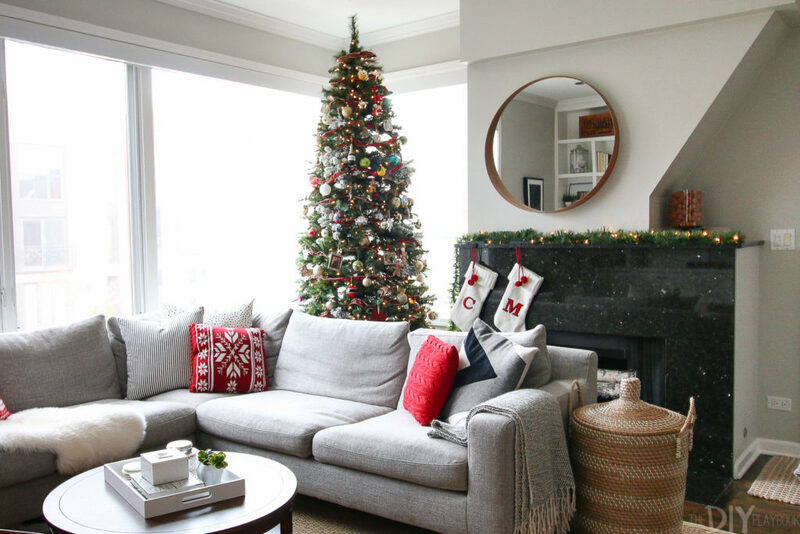 As home decor enthusiasts, the holidays are an opportunity to swap out our everyday decor for pieces that add some magic of the season to our homes. 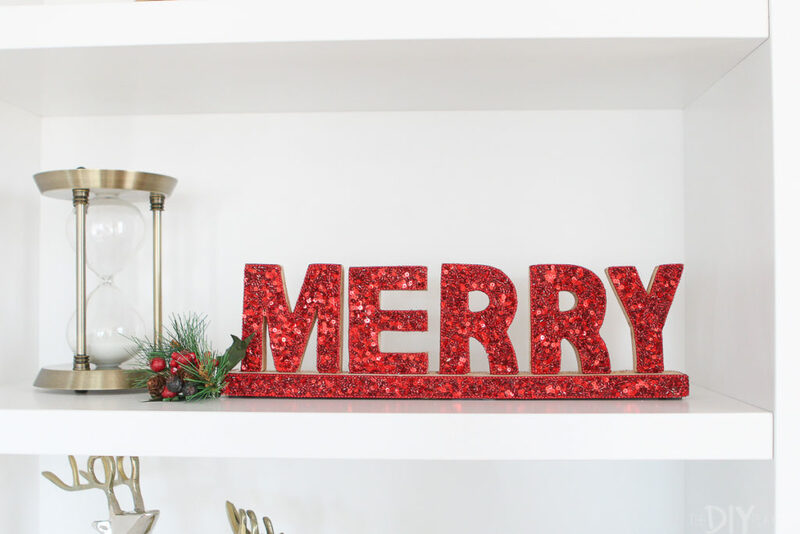 You could even say that decorating for the holidays is kinda like our Super Bowl! New to holiday decorating? 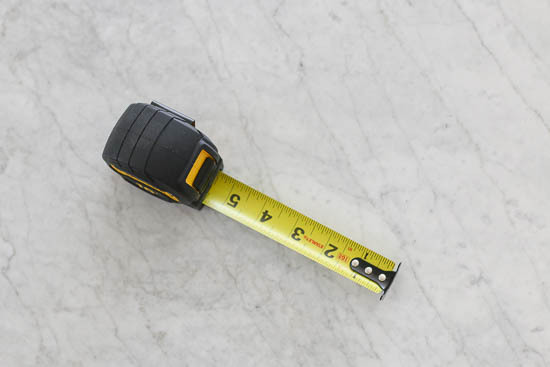 Go to the store and it might seem intimidating and kind of expensive to transform your space from top to bottom. But we are here to reassure you that you don’t have to go out and buy tons of new decorations to give your space that extra sparkle. Instead, there are plenty of budget-friendly (and free!) 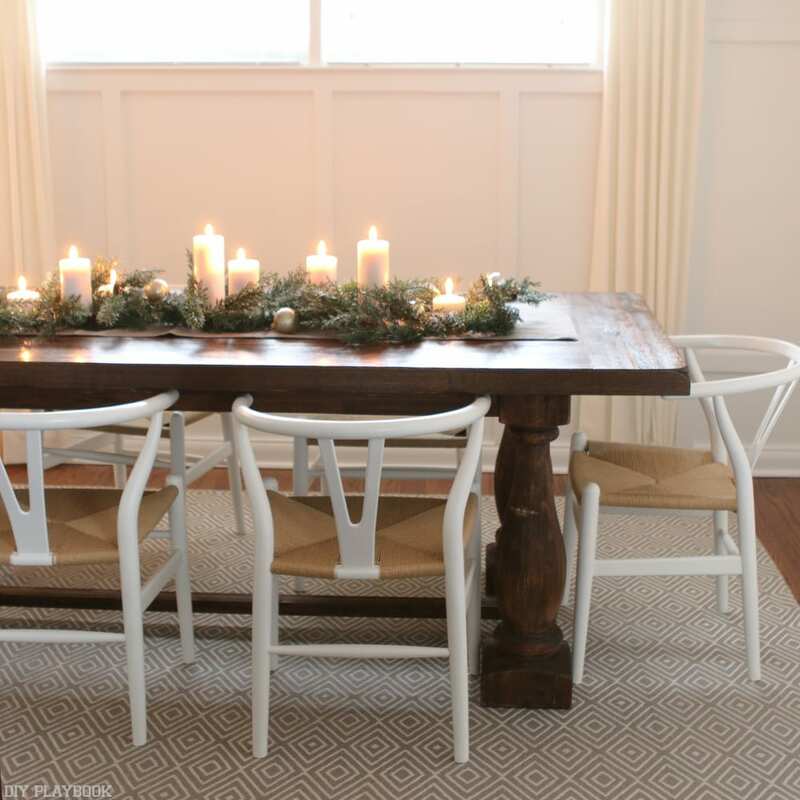 ways to deck the halls. If you want to make a big impact without buying tons of new items, we recommend starting with a color scheme. It can be gold and red, blue and silver, or honestly any color palette that you personally like. 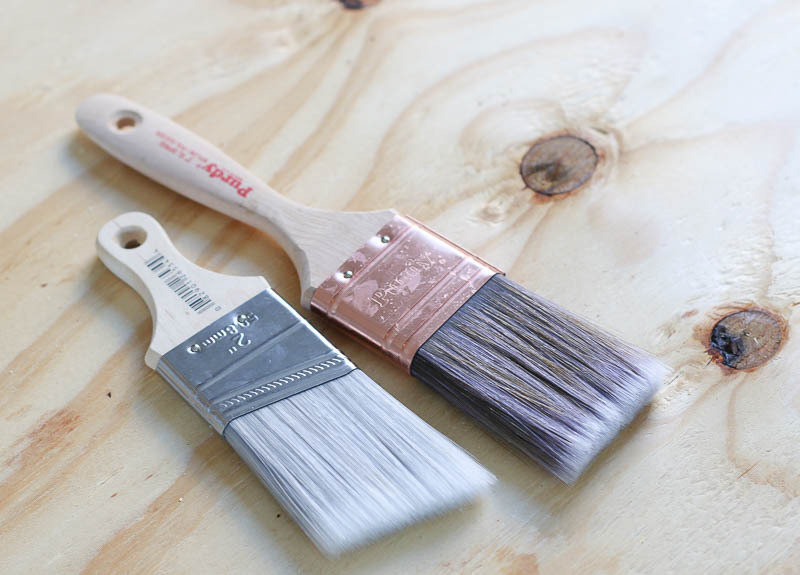 Choosing a few key colors/metallics will make decorating a lot easier. 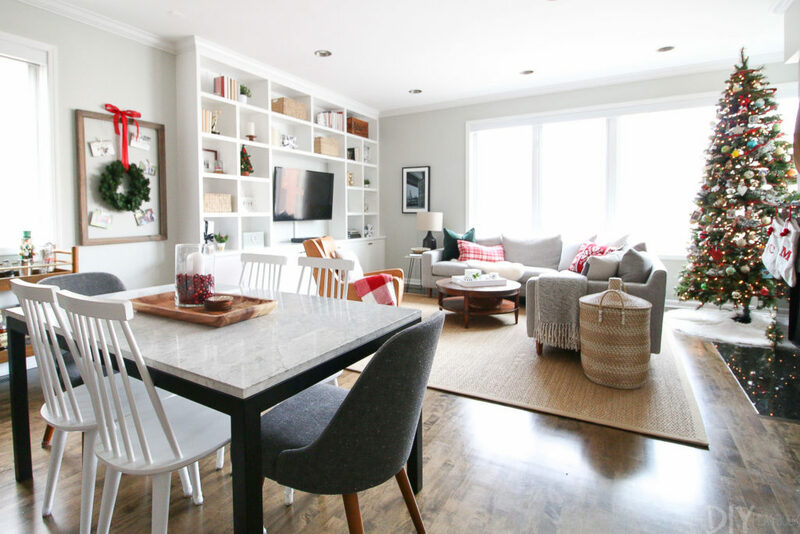 Stick with your color scheme and we promise you’ll end up buying fewer items to decorate your home for the holidays. 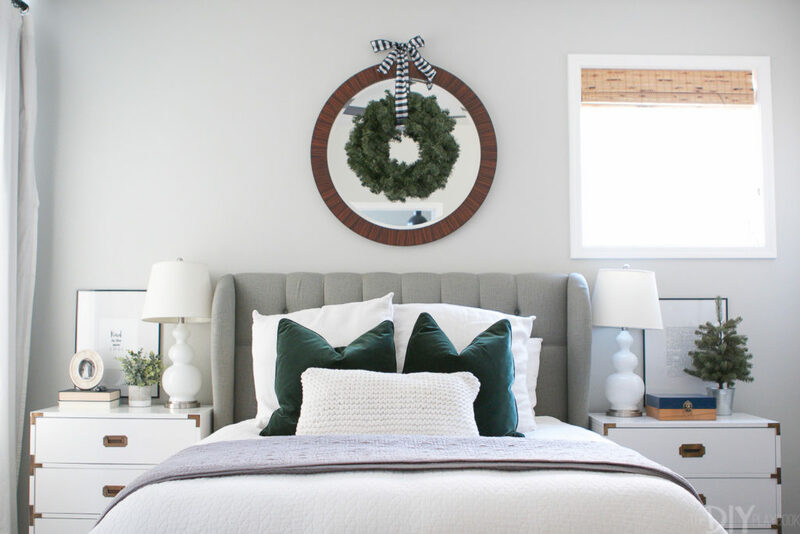 You can leave a lot of your everyday decor up in your space, but add these key colors for a pop of holiday glam that will really make your space look different from the everyday. 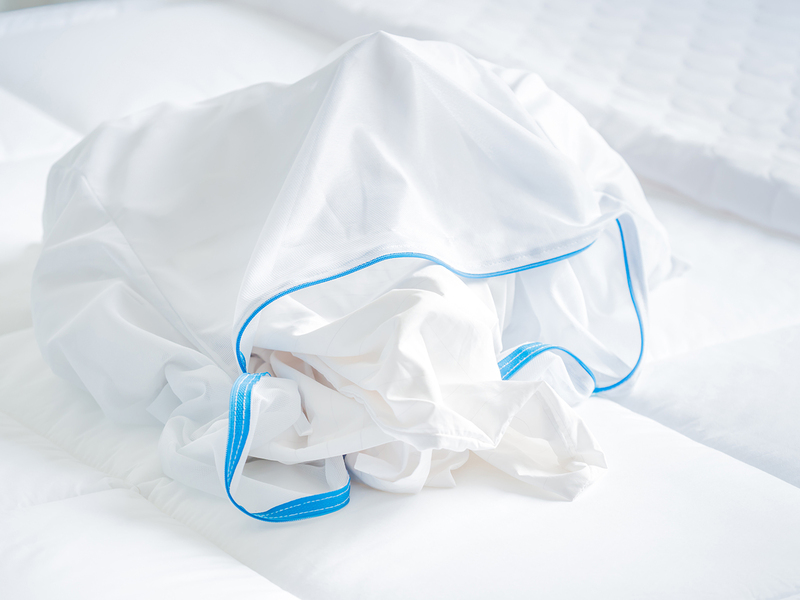 This tip may seem a little silly, but it’s actually a great one! If you’re an Amazon Prime enthusiast like us, then you probably get packages on the reg. Save a few of these shipping boxes, then use them as holiday decor. It’s as simple as it sounds. Wrap the empty boxes with pretty wrapping paper and ribbon – in your color scheme, don’t forget – and use them throughout your home. 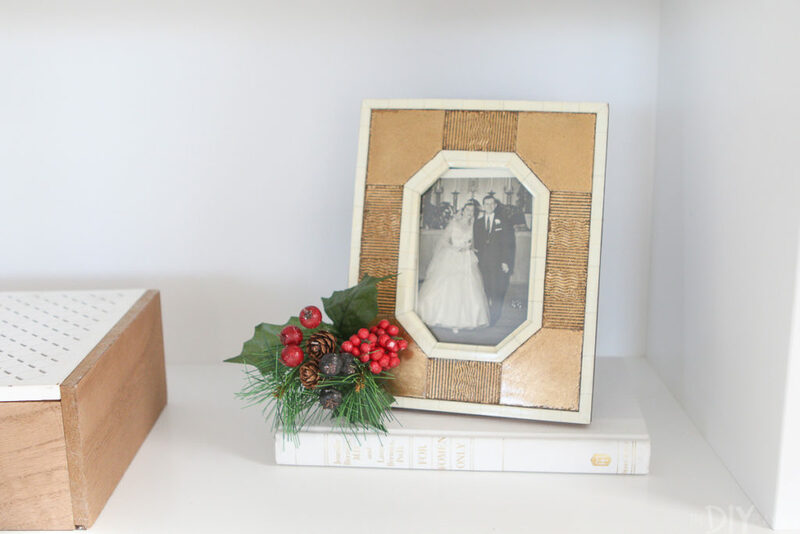 We both use these “gifts” as bookends on our built-ins, and place them strategically throughout our homes for a budget-friendly holiday touch! It doesn’t get much cheaper than that! 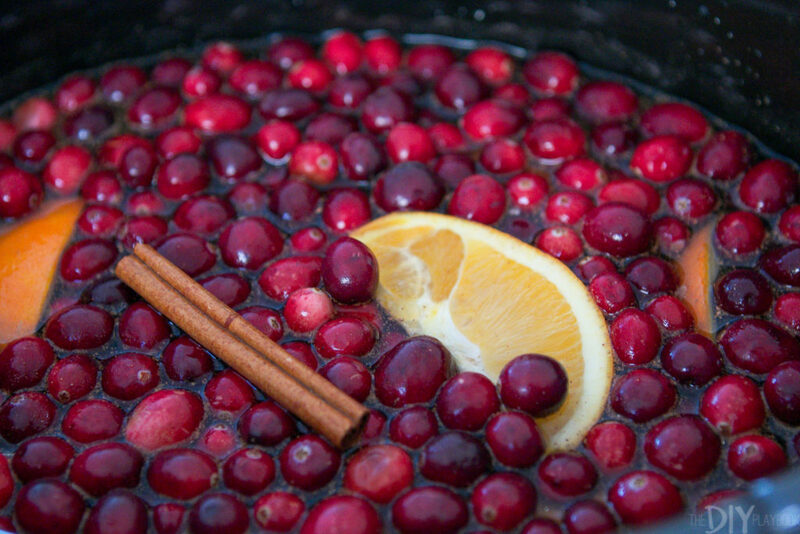 One of our favorite holiday crafts is using fresh cranberries in glass hurricanes with candles throughout your home. Cranberries are inexpensive and they add a colorful touch to your space. 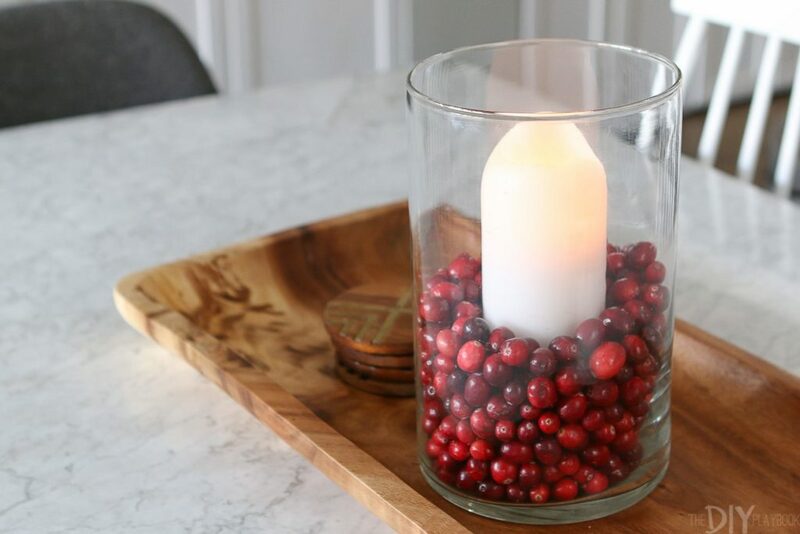 We especially love this idea, where you use water, faux greenery, cranberries, and floating candles to make a gorgeous centerpiece for your dining room table. While you’re at the store, grab some cinnamon sticks too. You can group a few of these together in a mug and display on a shelf for a decoration that looks and smells good! You can also pick up some branches from the grocery store (or even better, your backyard!) to place in a tall vase in your home. This brings a winter touch to your home’s decor. During the holiday season, we’re at the craft store just about every weekend. (Seriously.) 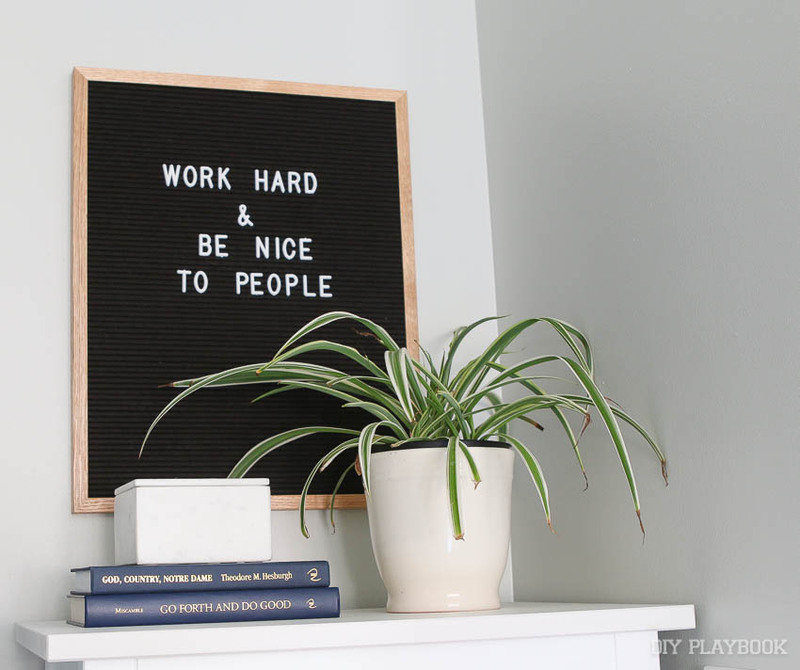 And the one thing we recommend everyone picks up is some faux greenery. You can buy a bunch of small pieces for a steal and this greenery can be used all over your home. Drape it on your mantle, put it on your dining room table, and add small pieces to your bookshelves. While you’re at it, pick up a few scented evergreen sticks. 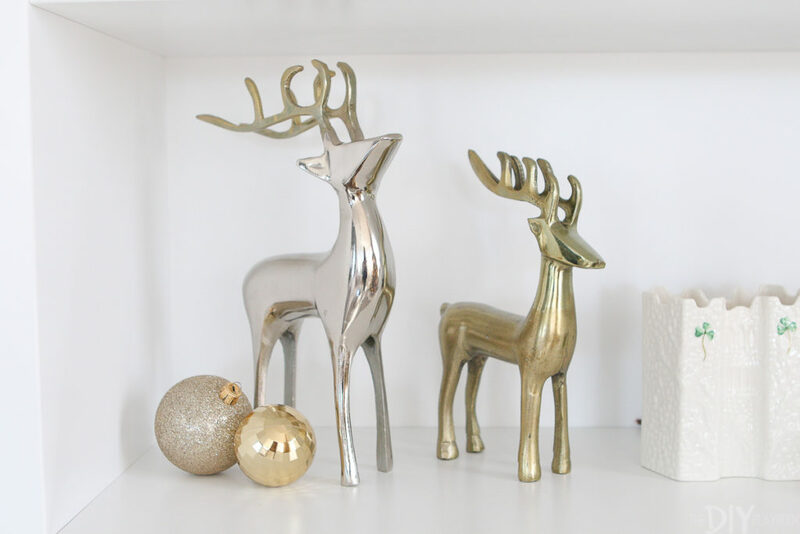 We love sticking these in the faux greenery to add a fresh winter scent to our spaces. 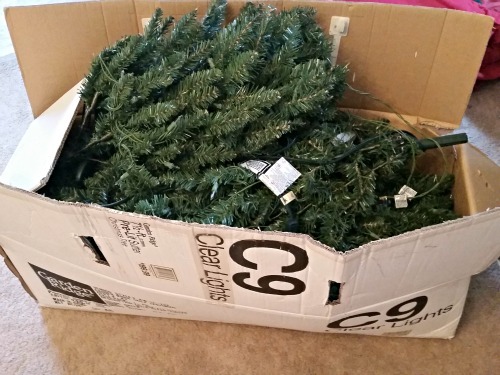 Nothing says the holidays like the smell of fresh evergreen! One of our favorite parts of the holiday season is all of the snail mail we receive. 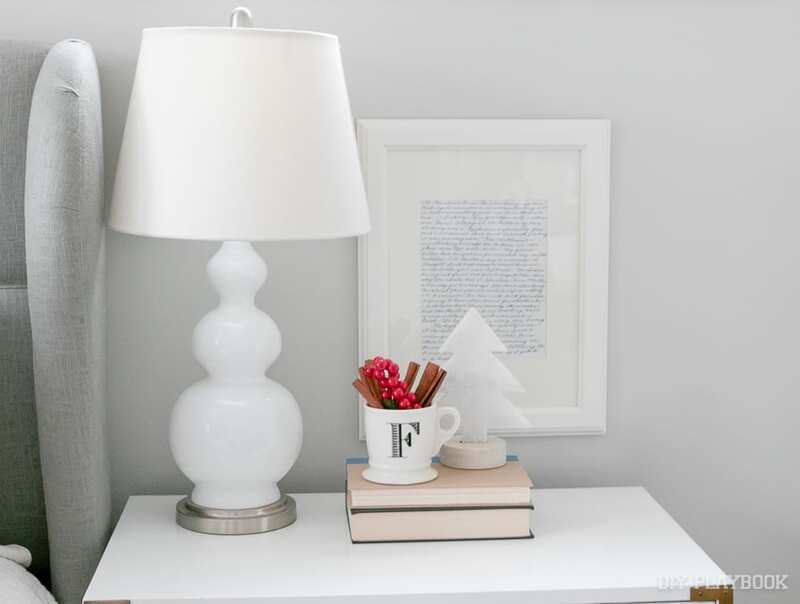 Instead of just throwing your holiday cards in a pile on your kitchen counter, get creative! In the past, we’ve used a big chicken wire frame to display all of the cards we receive and we hang them up with clothespins. This acts as wall art and it’s fun for guests to see all of the cards from loved ones everywhere. Another cool thing we do is save our holiday cards every year to make a little booklet of the many cards we receive. We display these booklets on our coffee tables so guests can flip through them when they visit. Plus, it’s a fun way to look back and see how families have changed over the years as this booklet gets bigger and bigger! Glass ornaments are a major protip. You can buy a giant pack of ornaments for a few bucks. 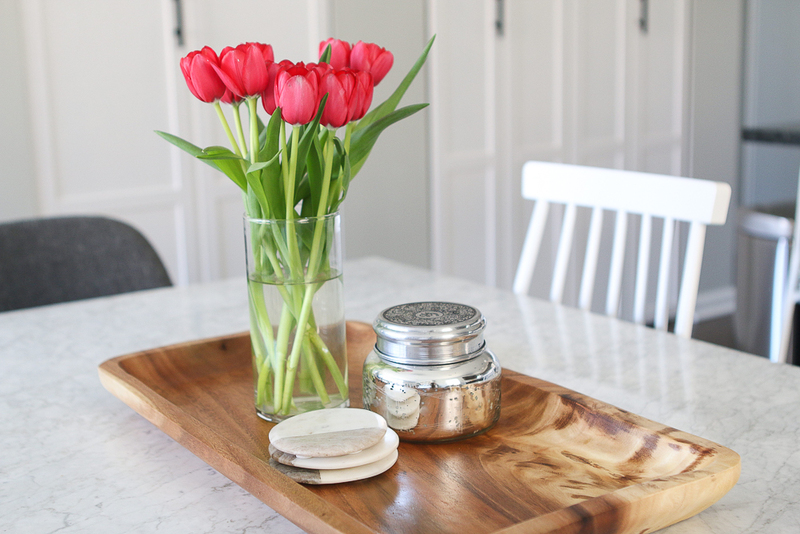 These always come in handy when we decorate our homes because they’re so versatile. Add some to a festive bowl, place some in a clear vase, and place a few next to holiday items on your shelves to add a sparkly touch! Don’t forget to change up your picture frames for the holidays! 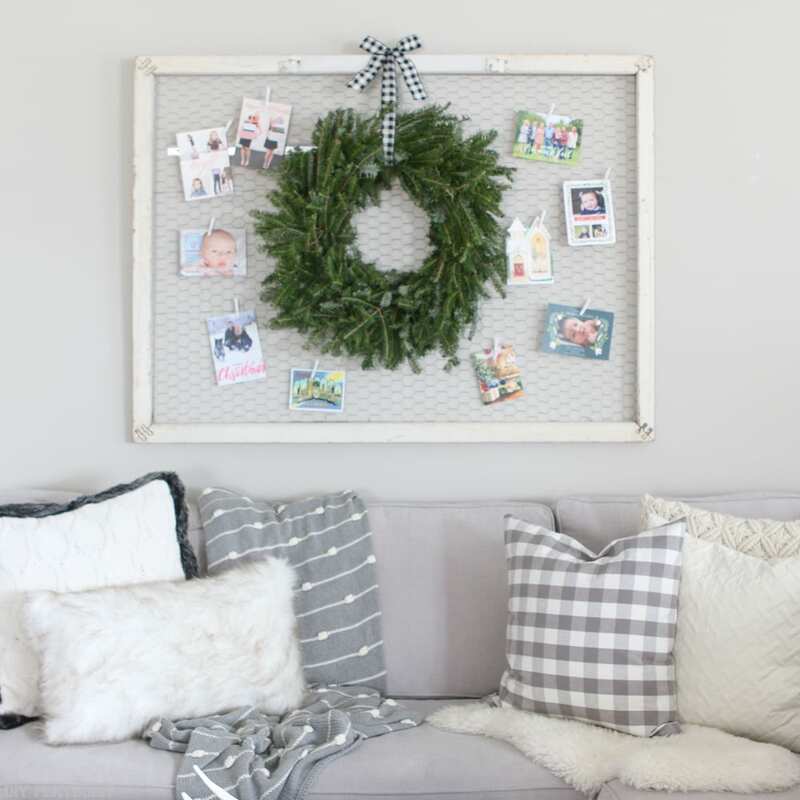 We love the idea of framing special holiday moments and places that matter to you during the season. 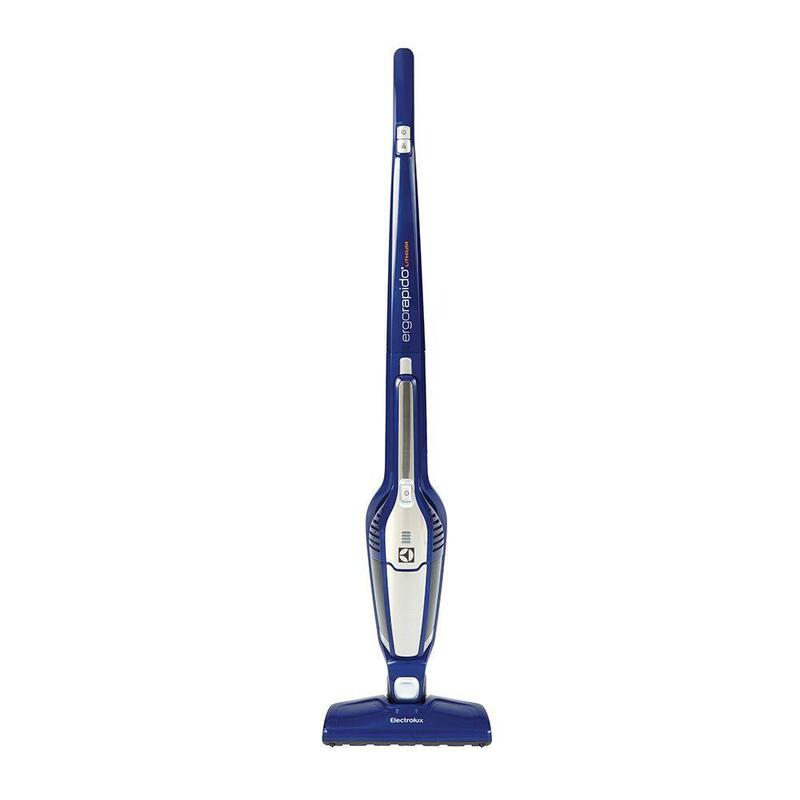 Want to save the most money? We channel our inner photographer and head around town to snap photos of favorite winter spots. The local ice skating rink, the big Christmas tree in town, a snowy tree … there are so many photo ops you can use to fill those frames! Or to make it easier, start a tradition now to take a special photo every year that you can use to display when you get out all of your holiday decorations. We hope you feel inspired after reading this list to get in the spirit of the season. 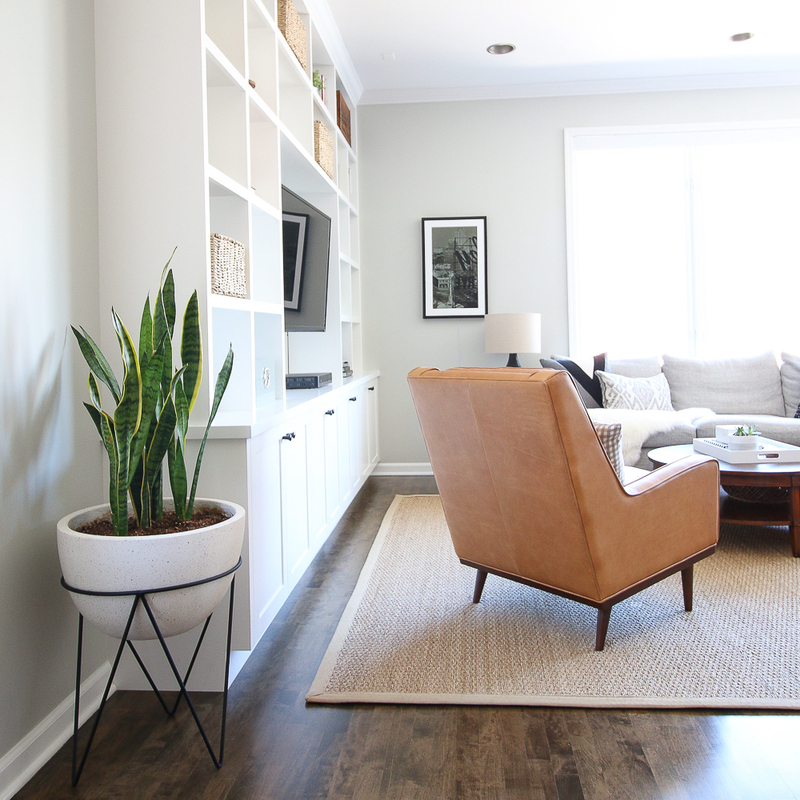 We promise you don’t have to spend big bucks to make your space feel special during the holidays. Turn on some holiday music, heat up some hot cocoa, and enjoy yourself as you deck your halls! Even though much of the holidays are officially behind us, we bet there’s probably still holiday decorations lurking around your home. And to be honest, both of us like keeping up our Christmas trees as long as possible, because you just can’t beat the soft, pretty glow of those lights. Sigh. However, it’s time to snap out of it and focus on the new year ahead (bring it on 2018! ), so into storage the holiday decorations must go. 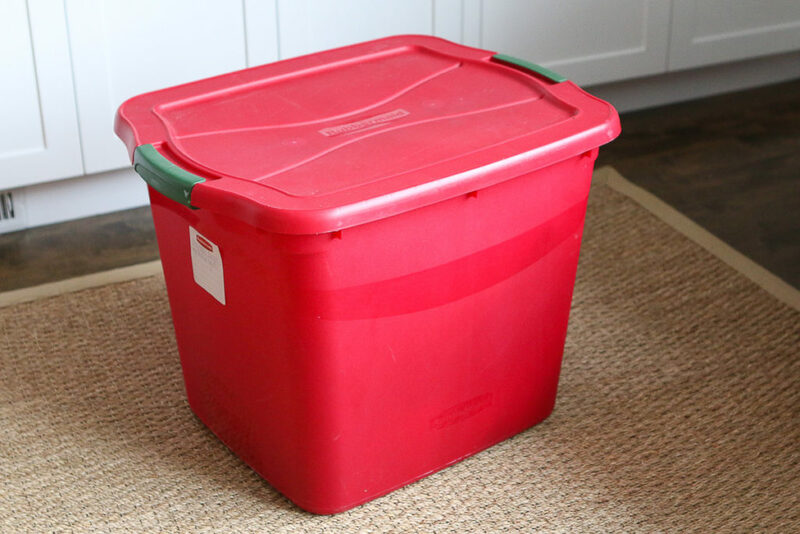 But before you throw everything into a big box and call it a day, we have some easy storage hacks to efficiently pack away all of those holiday items. 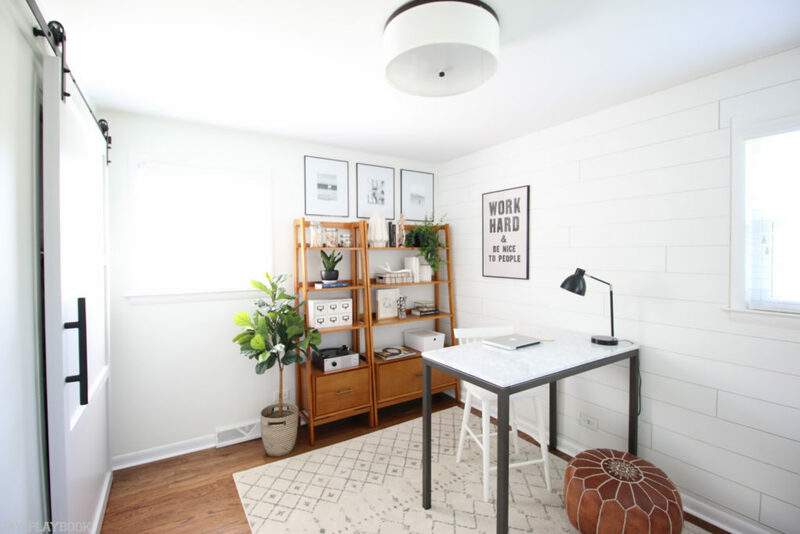 With these ideas, you can get a head start on your resolution to get your home clean and organized for 2018. 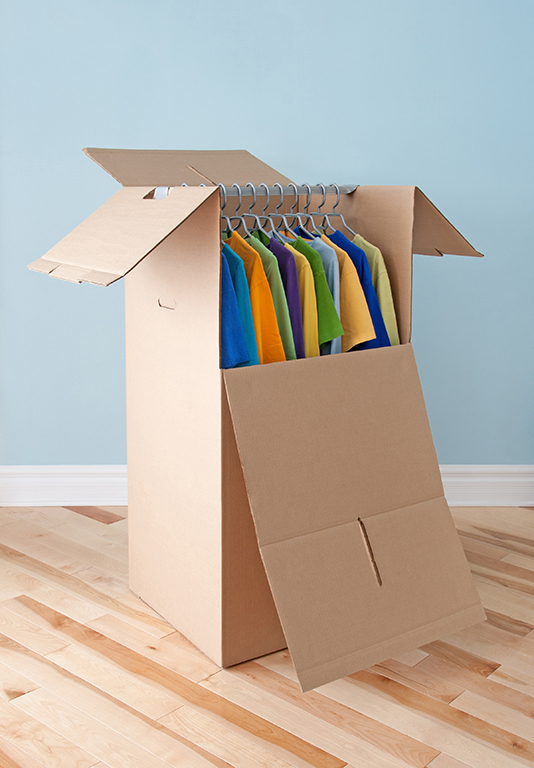 As with most organizational projects, we first suggest taking inventory of what you have and doing a nice little purge. Get rid of decorations you no longer love and donate them. There’s no sense holding onto items that never even make it out of the box each year. Once you have everything that makes the cut for next year, it’s time to buy the proper containers to keep everything organized. Invest in some different colored bins. We highly suggest color coordinating your holiday bins. We have red and green bins that hold all of our Christmas decorations. (Get it?) It makes it so much easier every November when it’s time to head to the storage unit and get all of the holiday decor. Instead of hunting, you just grab it! 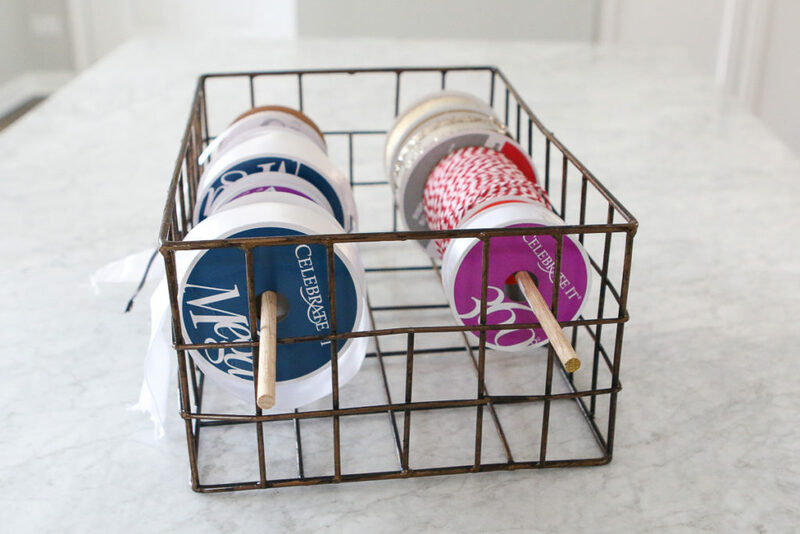 Obviously you can even use some washi tape (or a label maker) to still mark the contents of each bin. There are always great deals on organizational supplies after the holiday, so head to the store and grab the essentials. 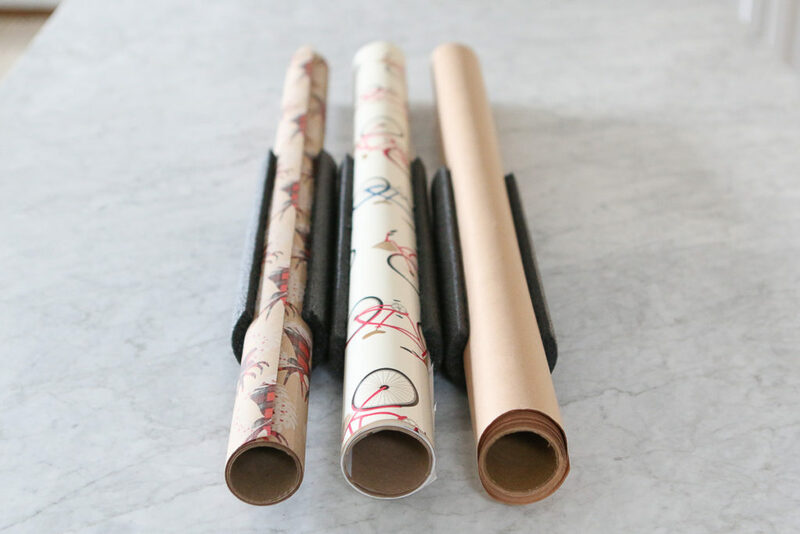 Get your wrapping paper under control. Wrapping paper has been a big nuisance in our household for quite some time. We used to put all of the rolls into the corner of a closet, and whenever you open the closet door they would tumble out and unravel. The worst. Not to mention the paper gets beat up and crinkled when it unrolls. To tackle this mess, we hit up the hardware store and purchased an inexpensive piece of foam pipe insulation. This cost next to nothing. We got the kind that comes pre-slit, so all we had to do was take scissors and chop it into one-foot pieces. We then slit the foam open and put it around the open wrapping paper to hold the container. Not only does this keep the open wrapping paper from unraveling, but it also prevents it from rolling around! Now, these rolls lay flat on the top shelf of our closet and are way more organized than before. This is a must-do lifehack, if you ask us. Store and protect your ornaments this way. We absolutely hate when we go to decorate our tree and half of our ornaments are broken or tangled together. Next year, we’re not letting that happen! Yes, we invested in a container that is meant to hold small items. You can buy these from a hardware or big box store, and they can hold dozens of ornaments easily. 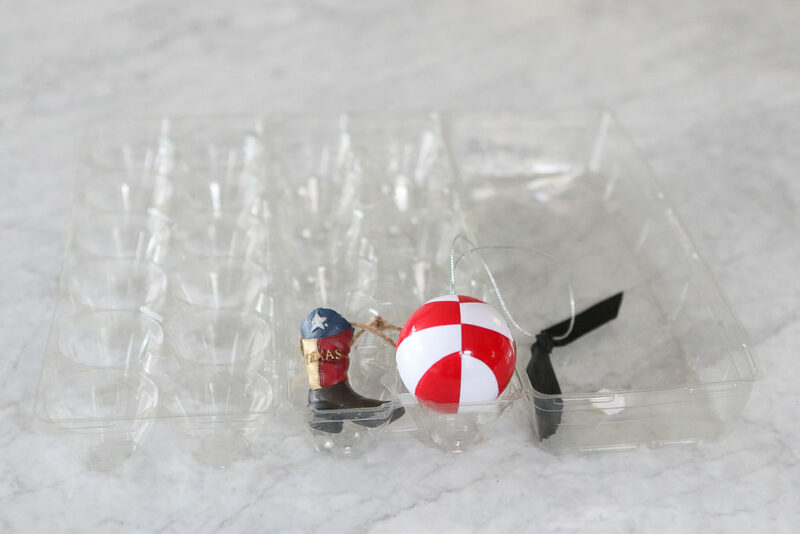 The grid easily keeps the ornaments separated and organized inside. 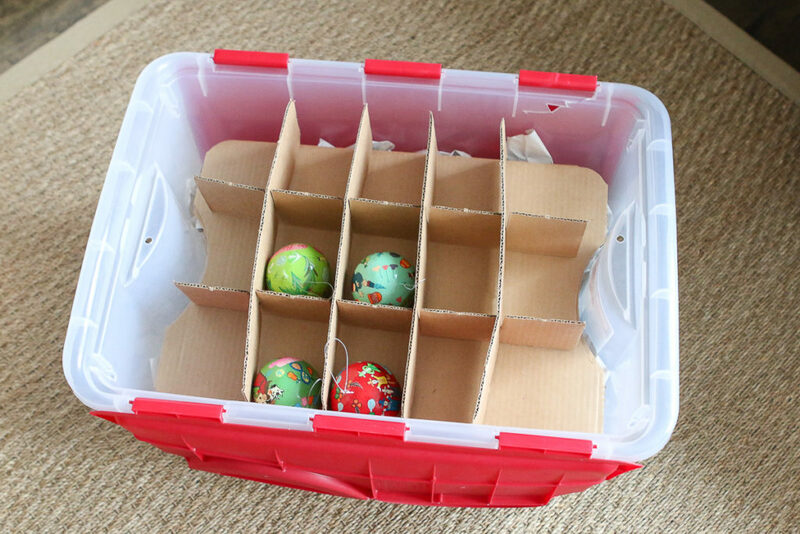 Before, we never really thought it was worth the money to buy this specific of an organizer, but trust us when we say that we are excited about the prospect of not opening up a box full of broken ornaments next year! Protip: If you have a bunch of small ornaments on your tree, save some egg cartons from the holiday season. These can be used to hold and separate lots of small and delicate Christmas ornaments. Each one gets its own little “cubbie” so it’s safe when you put it into a larger ornament box. If you haven’t noticed by now, the holiday season comes with lots and lots of gift wrapping. We already showed you how to tackle the paper clutter, but the bows are another beast. Personally, we both like to use silk ribbon to wrap our gifts (it just gives gifts a little something extra! ), and when you accumulate a lot of spools of ribbon things can get messy really quickly! We used to just keep all of our ribbon in one basket, but it would inevitably become a big tangled mess. We had to get creative. 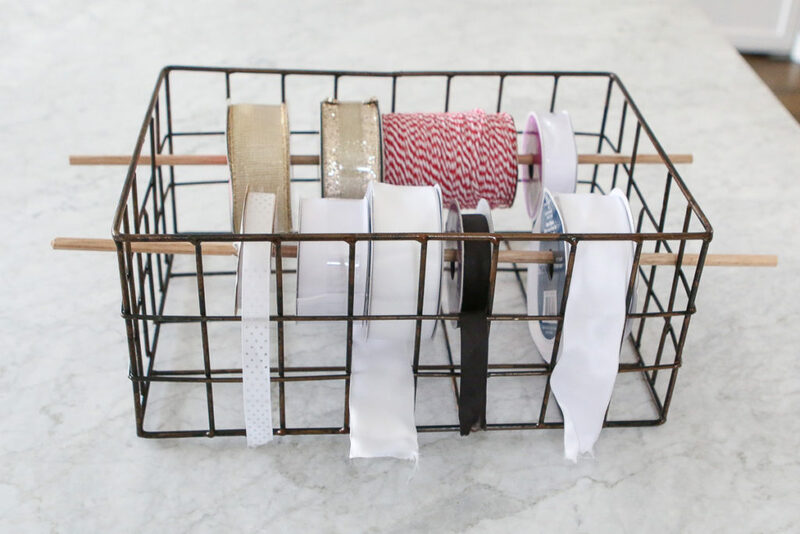 To keep things organized, we purchased a wire basket and a dowel for less than a dollar. We cut the dowel in half and fished it through the wire basket, along with the spools of ribbon. Now the ribbon is all organized and ready to pull through the holes of the basket! 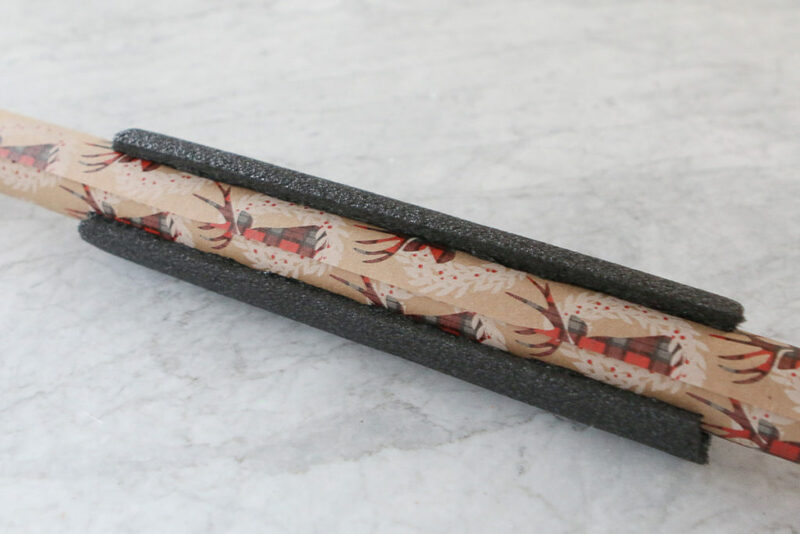 This will make gift wrapping a heck of a lot easier (and faster) during next holidays, or any time of the year, honestly! We know you may be ready to just throw all of your holiday decorations into a bag or box and into your storage unit. 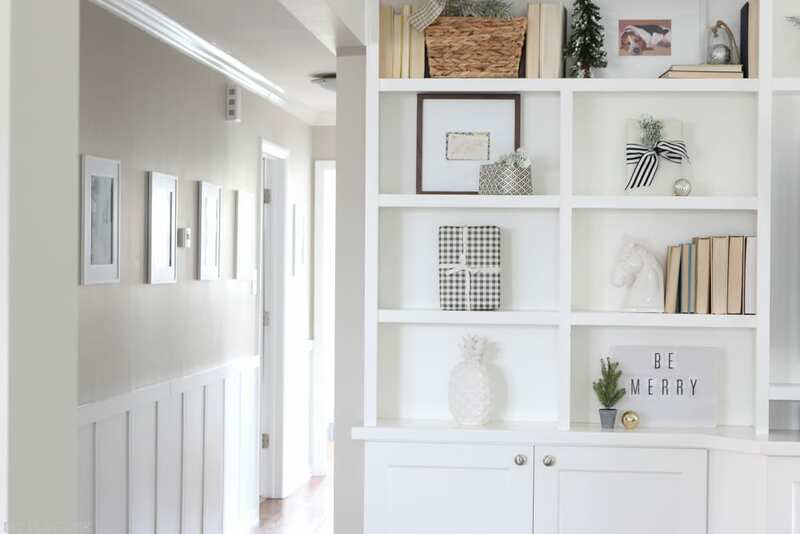 But taking some extra time to efficiently store your holiday decor is well worth it. Just think of how good you’ll feel next year when it’s time to deck the halls, and your holiday decorations are organized and ready to go! We love all of the amazing smells associated with this time of year … cookies in the oven, peppermint hot cocoa and fresh pine from a new Christmas tree. But because we’re holiday obsessed, we like to take things one step further. 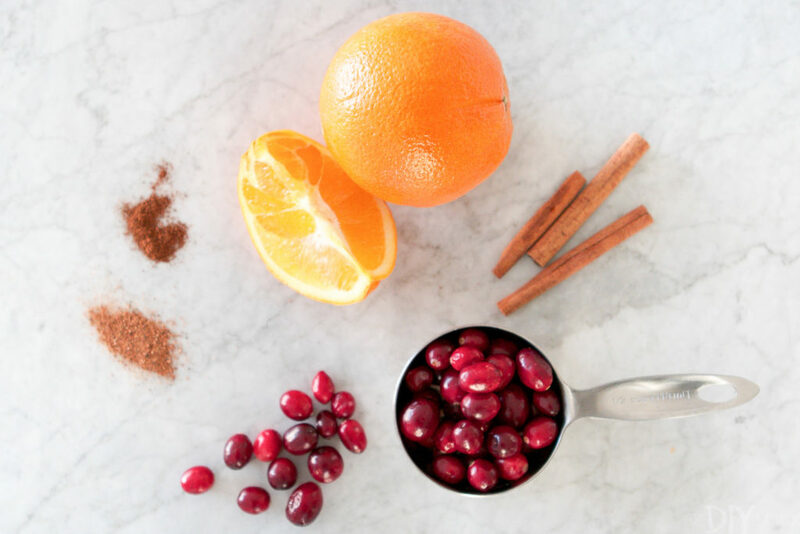 Yes, we have our own recipe for a potpourri to make your entire house smell like the holidays, and it works extremely well. Now we know what you’re thinking. Potpourri? Isn’t that the dried up stuff in my Grandma’s bathroom? Fear not, potpourri has made a comeback. And the potpourri we’re talking about is a mixture of fresh ingredients and spices that are warmed on the stovetop or in a slow cooker. Heating things up makes the concoction that much more fragrant, so it can fill your house with heavenly aromas! Combine all ingredients in a small pot and simmer over low for as long as you want. If the water gets low, add more and toss in some more ingredients. There’s no exact science to it, so add more of anything that you like. 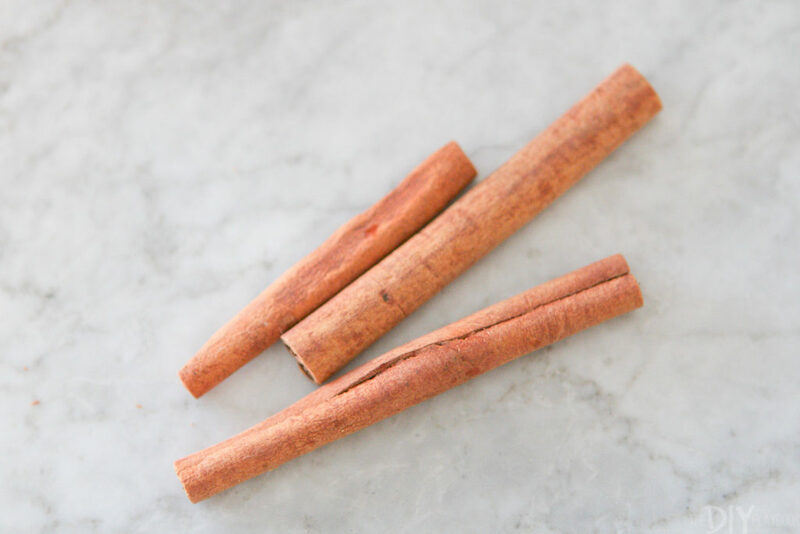 Personally, we love adding a few extra cinnamon sticks to really let that smell permeate throughout our homes. Enjoy the holiday smells all day long. 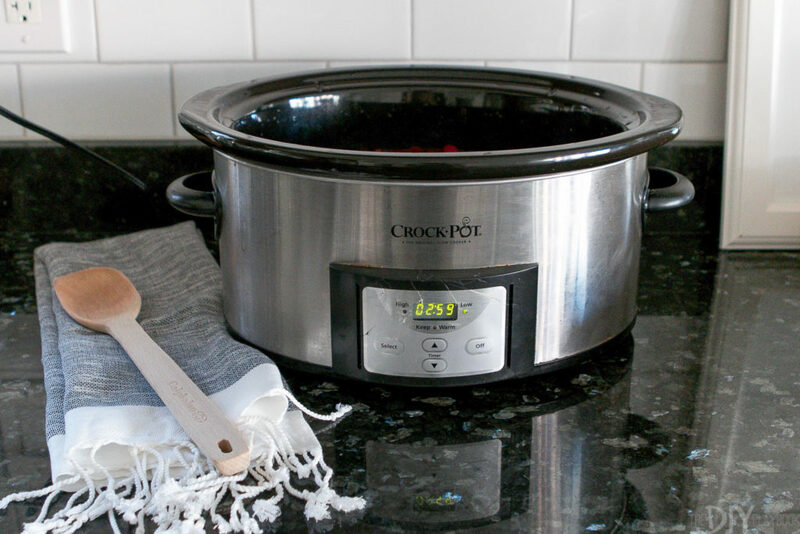 If you don’t want to leave your stove on all day long, we highly suggest using a slow cooker! Just place all of the ingredients in the pot and put it on low for a couple of hours. We actually did this when we put our Christmas decorations up this year. 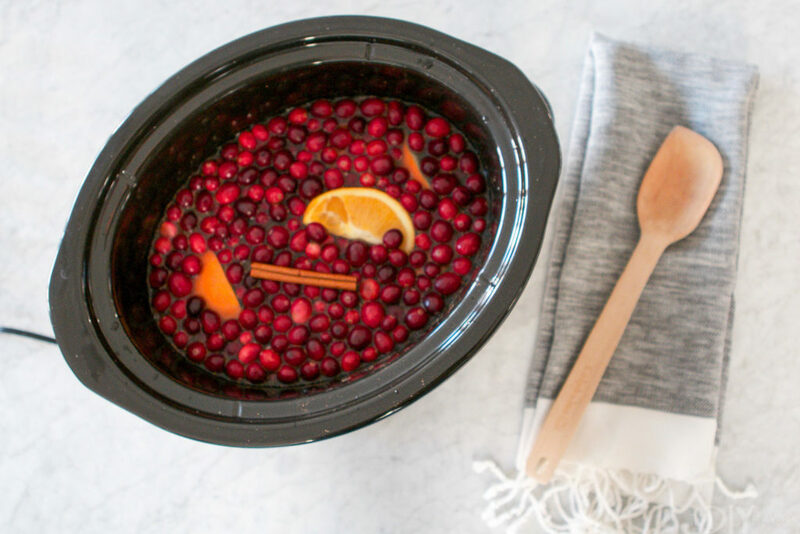 With Christmas tunes blaring, and this heavenly concoction in the slow cooker, our day of decorating was that much more enjoyable. But it doesn’t just smell amazing, this concoction is also a feast for the eyes. The cranberries add such a beautiful pop of color, along with the orange slices. If you’re hosting any holiday parties this year, we suggest you get this potpourri going a few hours before the party begins. 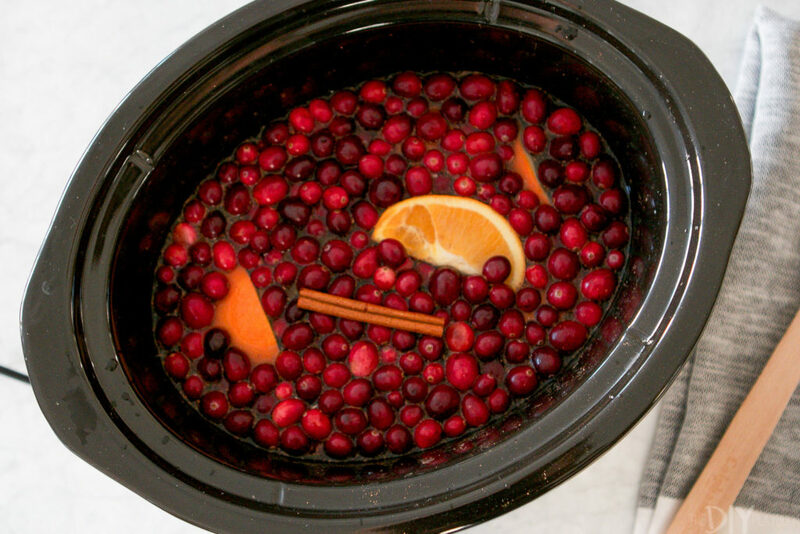 When guests enter they’ll be greeted with the amazing aroma of the season. If that doesn’t get you the title of “hostess with the mostess”, we don’t know what will! Cheers to a magical and fragrant holiday season! The craziness of Black Friday and Cyber Monday are officially behind us and we must admit, we scored some awesome deals! But it’s really easy to get swept up in to the “buy, buy, buy” mentality of the holiday season, especially when sales are constantly in your face. So today, while we’re still going to talk about buying gifts, we’re highlighting gifts that give back in some way or another. Every one of these gifts are not only great in their own right, but they are tied to a worthy charity. That way you can feel much better about your holiday shopping. 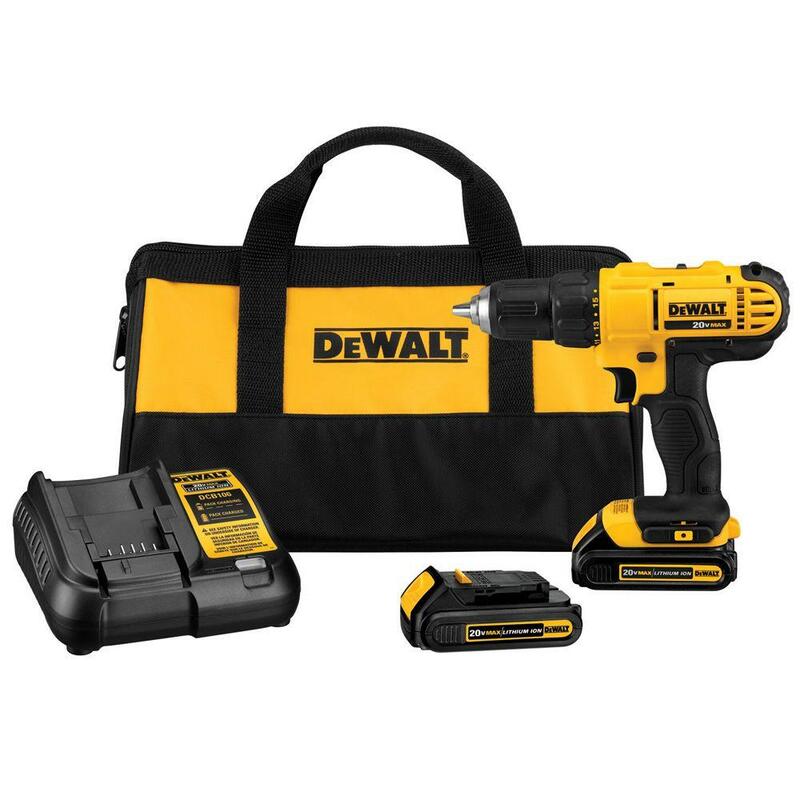 Here are nine of our favorite gifts that give back this holiday season! Both of our husbands can’t workout without their earbuds providing the motivation. 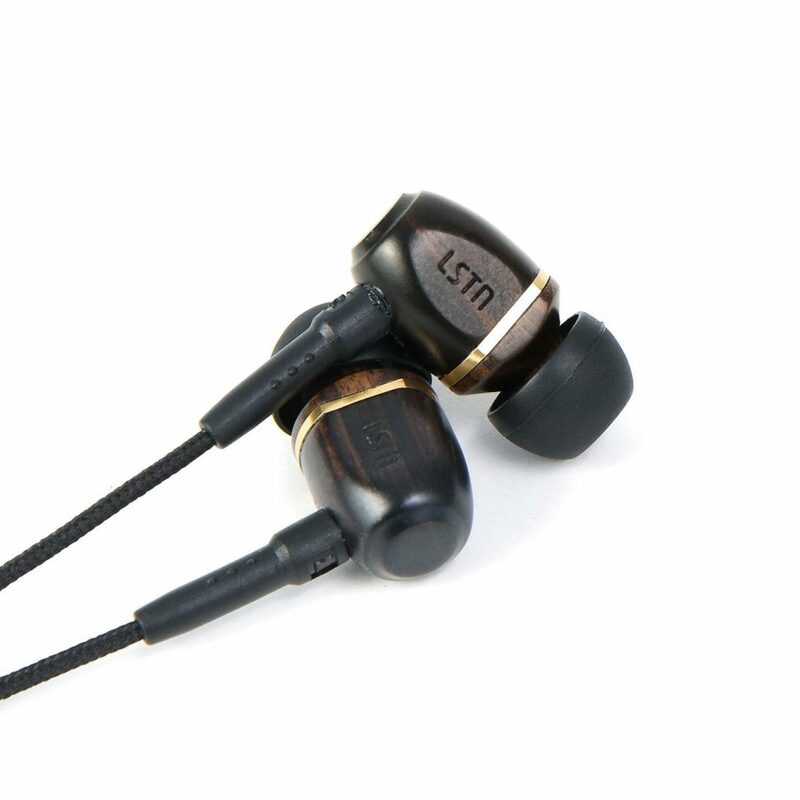 With that in mind, we love the idea of upgrading their headphones to these noise isolating ones from LSTN. Not only are they made with real wood (say what?! ), but proceeds help provide hearing aids to people in need. When you’re a kid, getting socks wasn’t the most exciting gift in the world. But now as adults, our husbands and brothers are always asking for cool socks! We love the variety of colors and styles from Bombas, but their mission is even better. 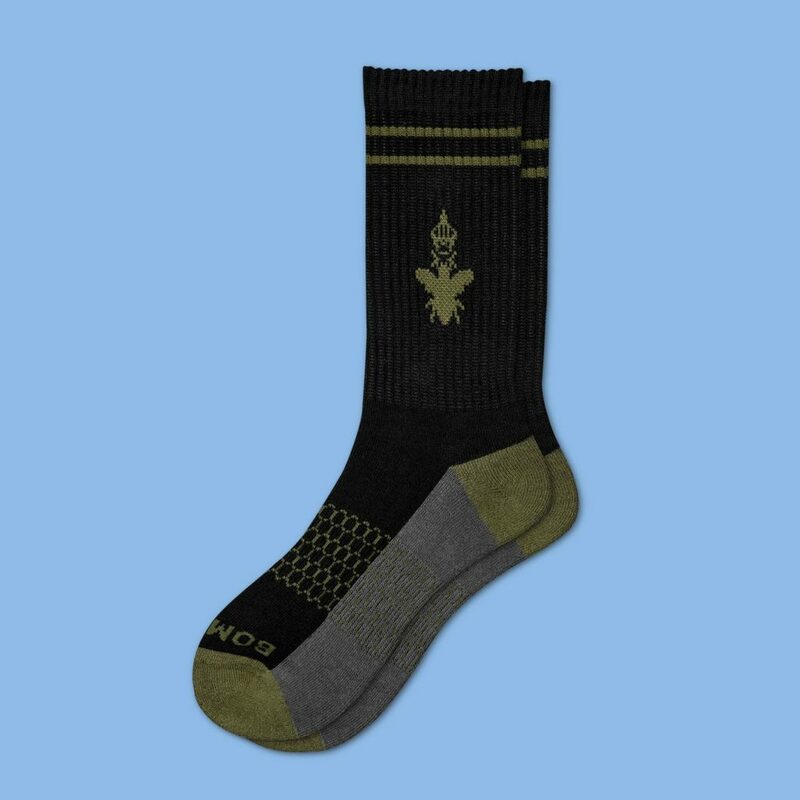 Because socks are the #1 most requested clothing item in homeless shelters, for every pair of socks purchased, a pair of socks is donated to the homeless community. 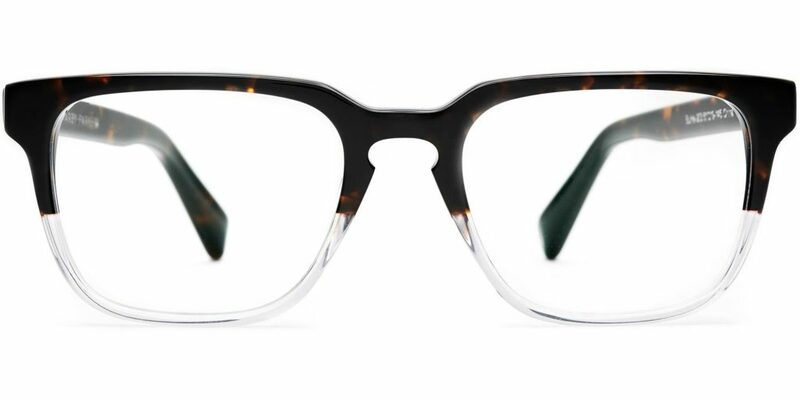 Bridget swears by her Warby Parker eyeglasses because they’re budget-friendly and totally on trend. Not only can you gift some upgraded frames to any guy on your list, but you can give the gift of sight through their “Buy a Pair, Give a Pair” program, which helps those in need around the world. We each have one of these watches! They’re on trend and are perfect for everyday wear. And while we love the look, we are even more in love with their positive impact. 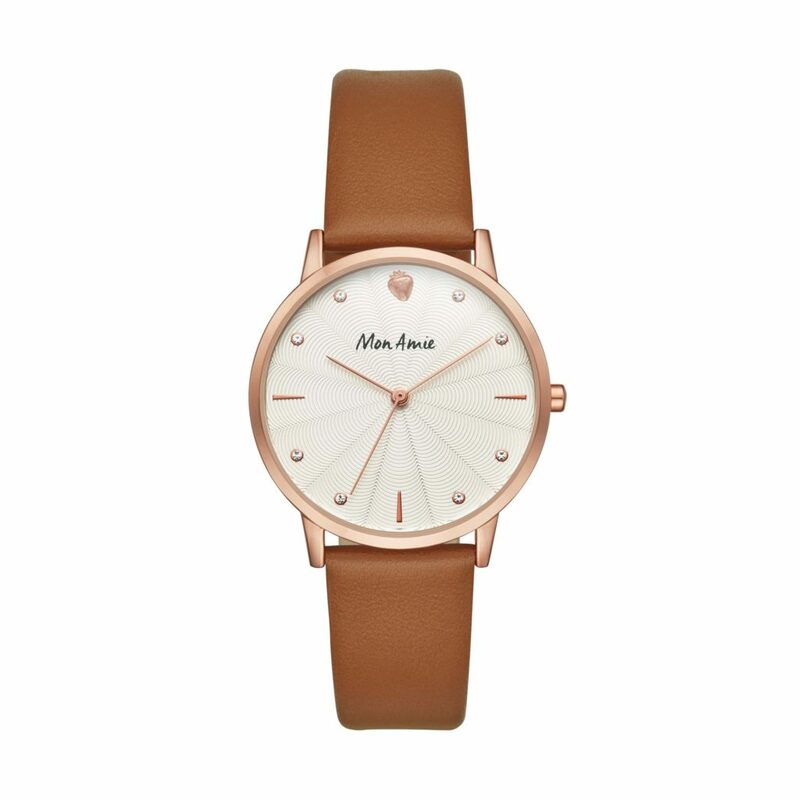 You can choose from five watch styles, with each one directly benefits a unique cause. 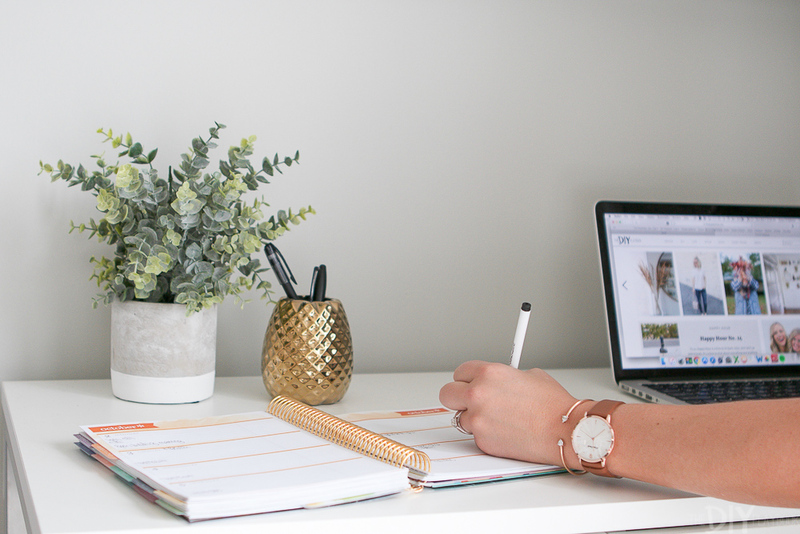 From clean water, to school supplies from students, you can choose the cause that is nearest and dearest to you when purchasing one of these watches. If you’ve heard of TOMS, you may already be familiar with the mission behind this progressive shoe company. For every pair of shoes purchased, a pair of shoes goes to a person in need. That 1:1 ratio is huge! Even more, in the past few years this brand has really stepped up their game with on-trend styles. 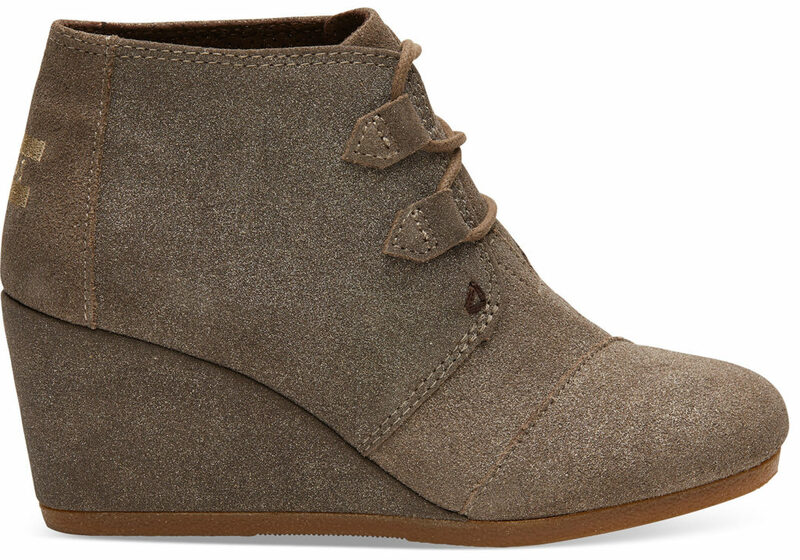 We’re both big fans of the TOMS wedge booties and think that any lady in your life would be happy to find these under the tree this year. You can never have enough candles! We absolutely adore gifting this fragrant home item to many people on our lists. 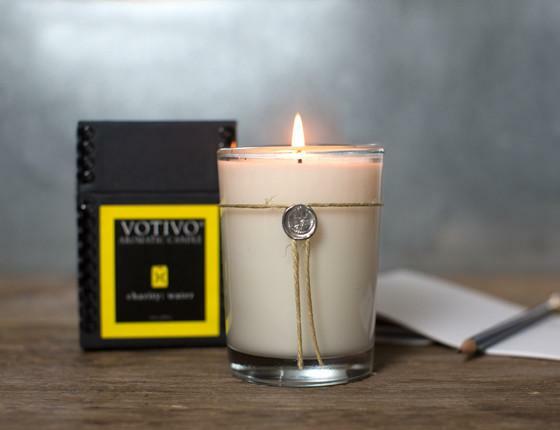 This candle is extra special because all profits go toward providing clean and safe drinking water to people in developing countries. Plus, the scent is “crisp, clean white”, which would work in pretty much any household. Everyone loves this gorgeous gift that gives back. How cute is this wooden block set? 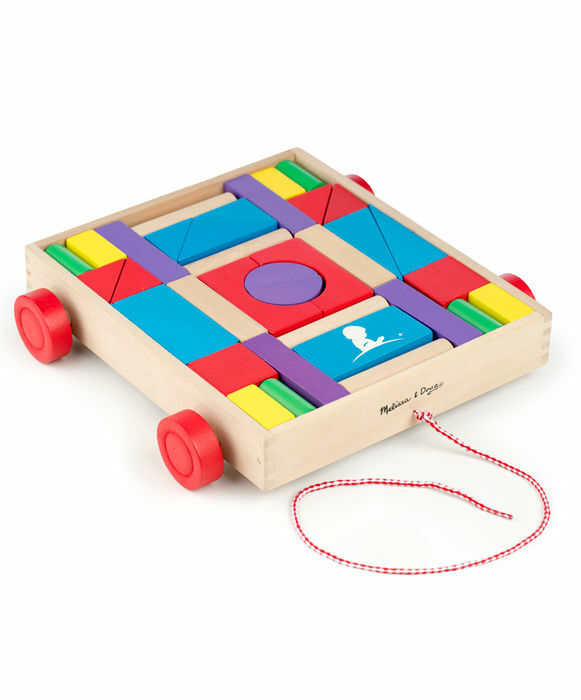 It’s colorful and helps kids with their hand-eye coordination. Win-win! This block set would be a special gift for any kid in your life, plus all profits benefit St. Jude Children’s Research Hospital. 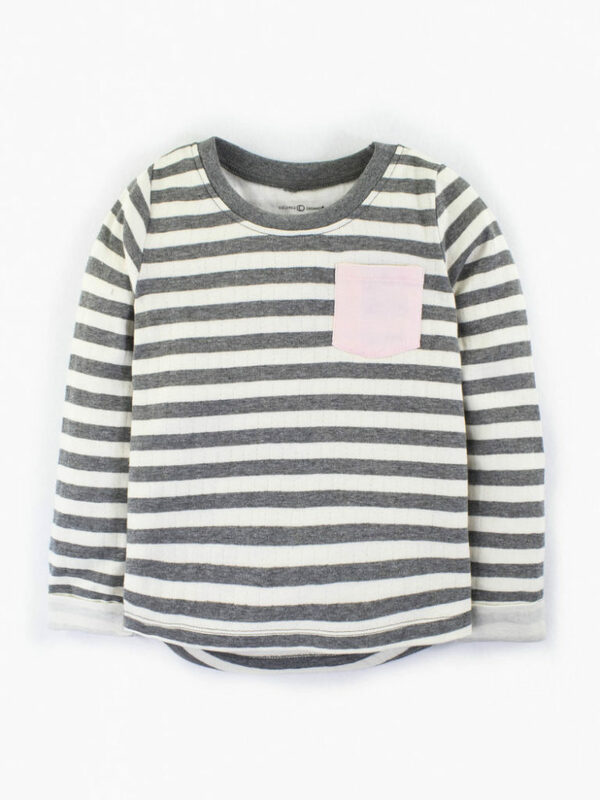 We recently stumbled upon the online store Colored Organics and are smitten with their gorgeous clothing for babies and kids. All of their clothing is made in a safe work environment, without child labor, and with fare wages for employees. But even better, up to 50% of their profits will go toward building orphanages for abandoned children in India. It’s official, if we were still in school we would totally rock one of these backpacks! 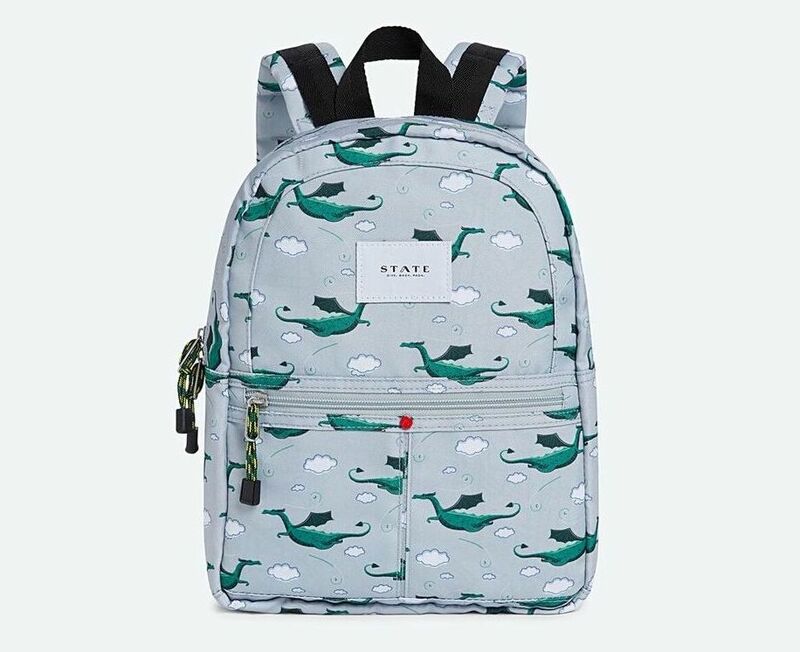 With backpacks and lunch boxes in tons of cool colors and patterns, you can’t go wrong gifting one of these to a child on your shopping list. Bonus points … for each sale, the company delivers a backpack stocked with school supplies to a student in need. 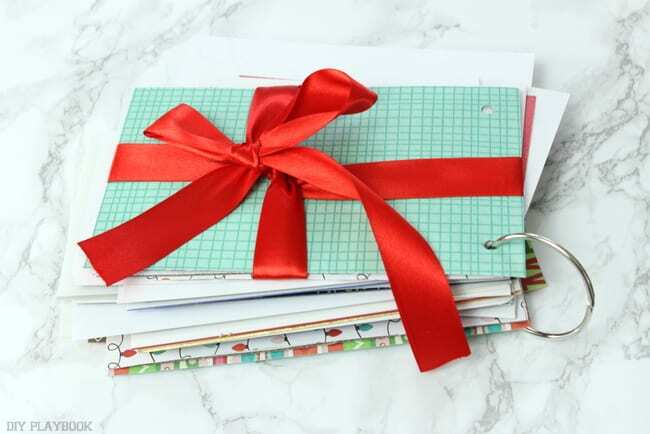 With these nine gift ideas, you can cross those final names off of your holiday shopping list knowing that your buys are helping more than just the lucky gift recipient have a joyful season. Your fireplace is the focal point of your room. As Director of Sales and Marketing for BrickAnew, I tell people this all the time. Stockings are hung from the mantle and graduation pictures are taken in front of it. But it’s also the dirtiest place in your house. One of the easiest ways to hide that mess is by adding glass doors to your fireplace. Spending the first year in a new home is a special time for new homeowners. Although this year may have been a bit stressful packing, moving, unpacking and getting settled, it’s this first holiday season that will be filled with extra magic and “first-time” memories. To help keep this time extra special, we have rounded up 12 gift ideas for the new homeowners in our lives. 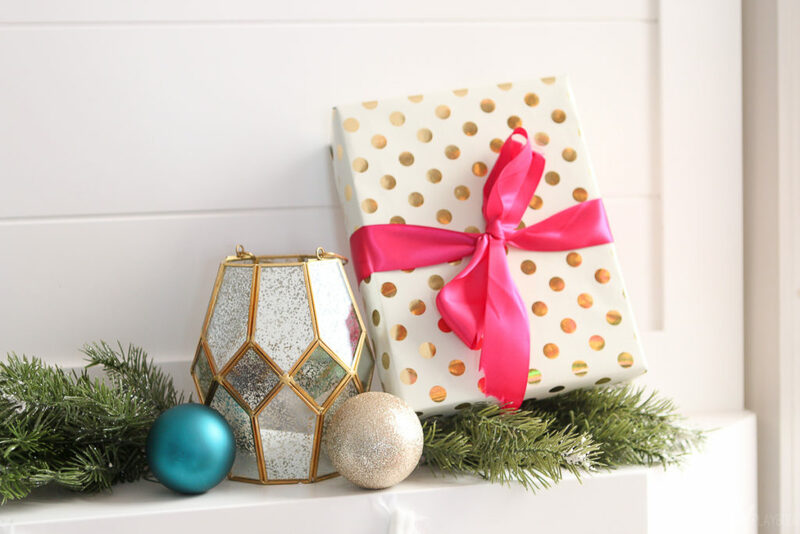 But heck everyone deserves an extra special holiday so these gift ideas, with price points from $8 through $180, are the perfect addition under the tree for just about anyone on your shopping list this year!